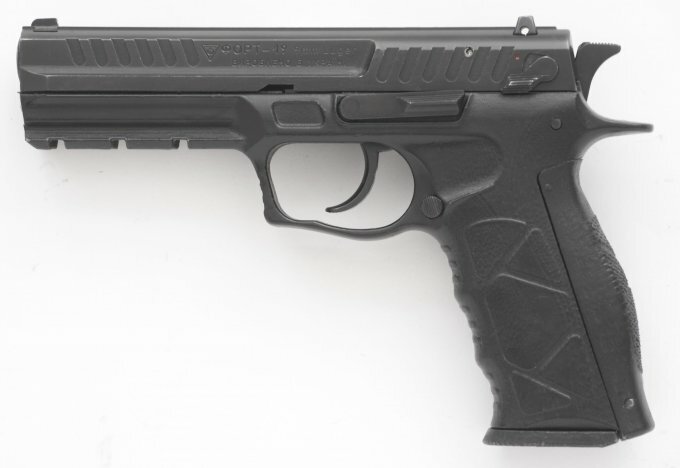 The Fort-19 pistol is manufactured by SIA FORT in Ukraine. It is an evolution of the Fort-14PP in 9x19mm Luger. There is also a Fort-19R variant, chambered for the unusual 9mm P.A. non-lethal ammunition. In Russia (and presumably) Ukraine, under certain circumstances it is legal to fire rubber bullets in self defence from what are called ‘Traumatic Weapons’. The other feature of this variation in this caliber is that it can fit one extra round in the magazine, taking the capacity from 16 to 17 rounds. Fort-19 is a short recoil operated (Browning type), locked breech semi-automatic handgun with Double Action trigger. A manual safety locks the hammer in cocked or lowered position. The lightweight frame is made from polymer and features removable backstraps of different sizes.